EDIT: I mistakenly identified the year this movie was made as 1965, when in fact it was 1970. After a long week at work, I decided to spend a bachelor’s evening in involving Chinese food, beer, and a Japanese movie, preferably one that required minimal use of my brain. My ideal movie would have involved Hirosue Ryoko and Formula 1 racing, but I picked up Zatoichi Meets Yojimbo (座頭市と世神保, zatoichi to yojinbo). At this point, star Katsu Shintaro, who was Zatoichi ever since the first movie, had taken over as producer. He decided to take two of the more popular fictional swordsmen at the time, which was his own character, and Yojimbo from Kurosawa Akira’s movie of the same name. Mifune Toshiroh returned to reprise his role. Had this movie been made more recently, I think Katsu would’ve somehow shoehorned Sato Takeru as Himura Kenshin somewhere. The plot was also more or less recycled from Kurosawa’s work in which Zatoichi and Yojimbo play rival gangs off each other to loosen their grip on a village. Sergio Leone already ripped off Yojimbo the previous year in A Fistful of Dollars, so Katsu figured out there’s no reason he shouldn’t even though Kurosawa sued Leone. There was also a romantic subplot involving Yojimbo and a prostitute (Wakao Ayako). While this was nowhere near the first Zatoichi film I’ve seen, I have not been watching them in order; I saw the original as well as two movies that came later, but before Zatoichi Meets Yojimbo. Katsu Shintaro started almost mass producing Zatoichi movies, so one doesn’t have to wonder why Katsu thought it made sense for the series to transition from the big screen to being a television series in 1974. Despite my not seeing the movies in order, Zatoichi Meets Yojimbo managed to stand on its own as a self-contained movie. I wish I could’ve said the same for the second Lone Wolf and Cub movie, incidentally also produced by Katsu Shintaro and starring Katsu’s older brother Wakayama Tomisaburo. As this movie was Katsu Shintaro’s brainchild with no involvement from Kurosawa Akira, one can reasonably expect that you can check your brain at the door when going into this movie. It’s definitely more of a fun swordfighting movie. Even earlier Zatoichi movies delved into philosophical depths more than this one did. There was one character who turned patricidal when enticed with gold. Had he been in the movie for more than ten minutes, I probably would’ve been inspired to care. 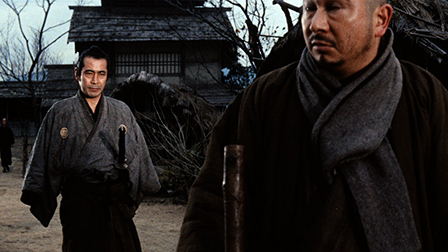 My main grip with the movie was that I wished I saw Zatoichi and Yojimbo share the screen more. Much of the movie saw them do their own things. While the title of the movie led me to believe that it would be the ultimate crossover story, I saw their paths intersect every so often as opposed to the movie having them in an epic battle or joining forces for the whole movie. I also thought Katsu and Mifune worked well together onscreen, so I would’ve liked to see, if nothing else, the two actors doing their thing. It was also just a little too obvious the town the whole movie took place in was a giant set constructed on a studio lot. Despite those issues, Zatoichi Meets Yojimbo will satisfy your need for entertainment that’s not going to tax your brain a whole lot. It is by no measure a great Japanese movie; both Zatoichi and Yojimbo have been in far better films, and you don’t need me to explicitly tell you who between the two was in no less than two cinematic classics. If you know of any good Japanese movies involving auto racing, please share! No, Drift Special: Beauty Battle doesn’t count.